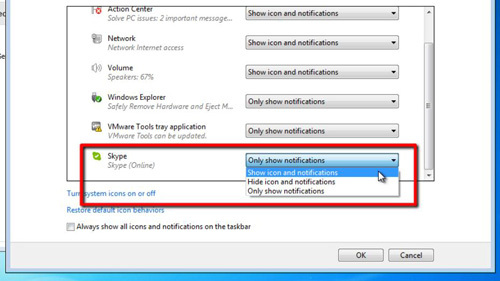 In this tutorial you are going to learn how to minimize Skype to system tray in Windows 7. Open Skype and make sure that you are signed into your account. In Windows 7, the system tray is now called the “Notification Area”. This is the collection of icons on the lower right hand portion of the taskbar. Just as you were able to customize the “Sytem Tray” in Windows XP, you can also customize the “Notification Area” in Windows 7. Click on the small upward facing triangle in the “Notification Area” and choose “Customize…” from the menu that pops up. The “Notification Area Icons” control panel starts. Select “Show icon and notifications” from the pop-up menu under the “Behaviours” column that is associated with the “Skype” Icon in the “Icons” column. Click the “OK” button at the bottom of the window to confirm the settings. 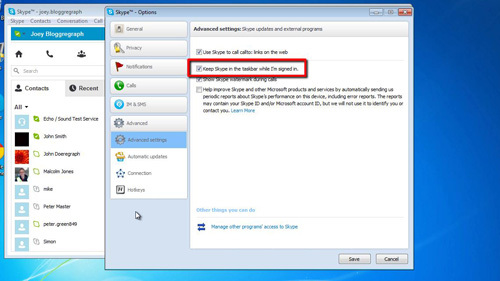 This is how to minimize Skype to the system tray in Windows 7. You might find that Skype still remains in the task menu rather than just the notifications area, even when we press the close button. This can be fixed by clicking “Tools” in the main menu and then clicking on “Options”. 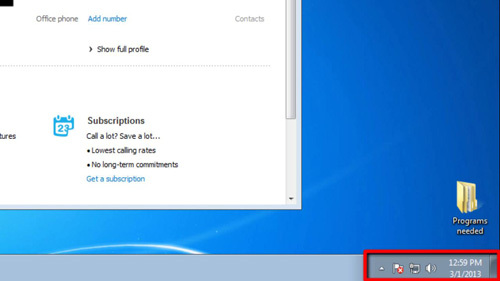 Click on “Advanced” in the left hand set of tabs and uncheck the box “Keep Skype in the taskbar while I’m signed in”. Click “Save” and now when we press the close button it will only appear in the notifications area.